...... 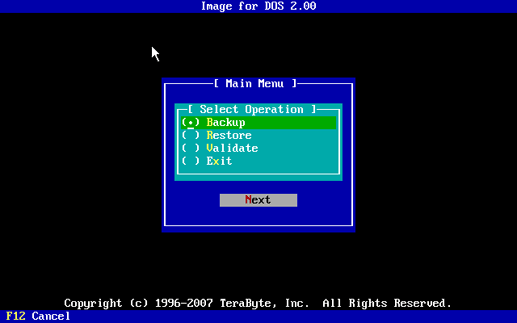 Image for DOS can also image to or restore from just about any drive letter, including network drives. The program can also directly access FAT, FAT32, and NTFS partitions, as well as most writable USB 2, IEEE-1394, ATAPI- or ASPI-accessible CD or DVD drives, without the need for any special drivers. By default, backups made to CD/DVD are bootable, which provides you with a convenient recovery CD/DVD. Image for DOS works seamlessly with on-board hardware- and firmware-based RAID. Program for image editing and image effects creation. Qweas is providing links to Image for DOS 2.66 as a courtesy, and makes no representations regarding Image for DOS or any other applications or any information related thereto. Any questions, complaints or claims regarding this application Image for DOS 2.66 must be directed to the appropriate software vendor. You may click the publisher link of Image for DOS on the top of this page to get more details about the vendor.